Robert Denogent is in a class of his own making wine in Southern Burgundy. The wines of Robert Denogent offer amazing value. They are often compared to their neighbours to the North, the great white wines of the Cote D’Or, for their richness and expressiveness. 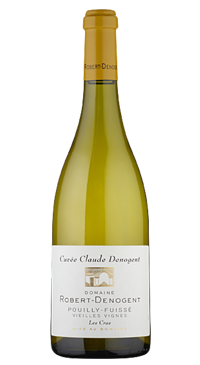 Domaine Robert Denogent Pouilly-Fuissé “Cuvée Claude Denogent” Les Cras (a mouthfull to say and to taste! ), is crafted from 85 year old Chardonnay vines growing on limestone soil. The grapes are hand harvested and gently pressed before a natural fermentation takes place thanks to indigenous yeasts. The wines undergo malolactic fermenation. Wines are aged for 18 to 30 months in the same barrels (20% new, 50% two passages, 30% more than two passages). Wines are racked 3 to 4 weeks before bottling.